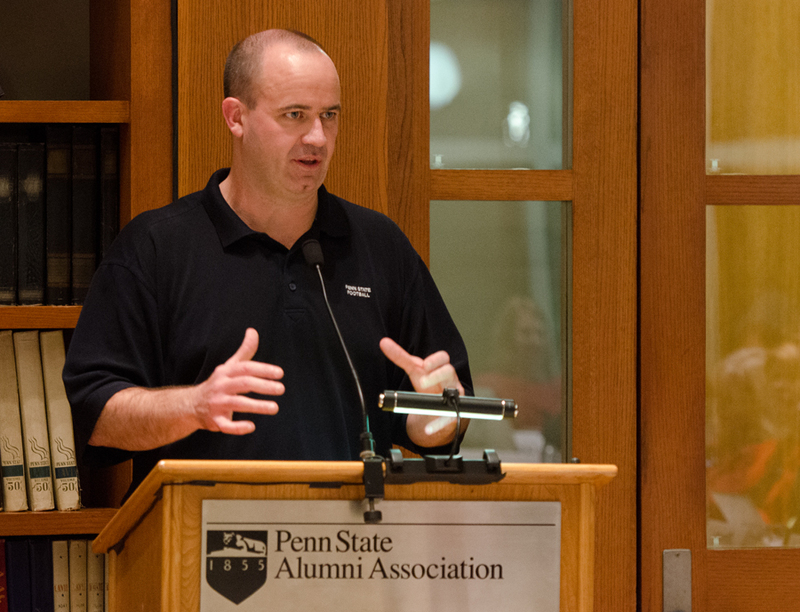 Right after football practice last evening, and right before he headed up to Rec Hall for the basketball Hoops Madness event, head football coach Bill O’Brien paid a visit to the Penn State Alumni Council, which is having its twice-yearly meeting this week. Our executive director always tries to have a special guest as a treat for the Council members, and O’Brien was obviously a good choice—they gave him a standing ovation when he was introduced and another when he was finished speaking 15 minutes later. Alumni Council members seemed pretty happy to see Bill O’Brien. To say that O’Brien is a popular speaker wherever he goes would be an understatement. Some fans and media may have been a bit skeptical when O’Brien was hired, but by now I don’t think there’s anyone in Nittany Nation who hasn’t fallen in love with this guy. “We have played well on the field, and all the credit goes to the players. We have a very unique team. We have a team that went through some obviously unprecedented situations…. These guys that stuck with us are true Penn Staters. They’re what Penn State is all about. “Nothing at all against the guys that left, but these guys that committed to this university, to this coaching staff, and to this football team mean a lot to me. More than anything they mean a lot to this whole university, this whole community. “It’s led by a fantastic senior class. You’ve heard a lot about Michael Mauti and Jordan Hill and Matt McGloin, but there’s about 25 of those guys. Guys like J.R. Refice that you’ve never heard of, probably, who are fantastic kids who are gonna graduate with Penn State degrees and go on to be huge successes in life. And, really, at the end of the day that’s what it’s all about. Entry filed under: Alumni Association. Tags: Alumni Council, J.R. Refice.